본 교재는 캐나다 현지 교과과정에서 사용되고 있는 교재로서 영어의 기본 요소인 읽고 이해하기, 발음, 퍼즐, 논리적사고, 문법, 단어맞추기, 작문등의 전반적인 영어학습에 대해 종합적으로 학습하는 가장 기본적인 교과과정입니다. 캐나다 전국에 걸쳐서 수많은 학교에서 이미 많이 사용되고있는 매우 훌륭한 교재입니다. 각 레벨별 총 96페이지로 제작되었습니다. 저희 교과과정에서 가장 필수적이고 기본이 되는 교재입니다. "Great job! Your Math and English Smart books are excellent and it's nice to see Canadian content for our children... I am very impressed with your books. I thank you and keep up the good work." "Your EnglishSmart is by far the most systematic and substantial workbook I've come across." 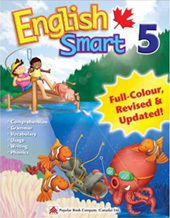 "When visiting Toronto last month I bought 1 & 3 of your EnglishSmart books. When I returned to Mexico, I realized that these books worked very well with the English students I am tutoring..."
"I recently purchased some of your books from Costco. I think they are terrific." "She loves EnglishSmart so we are going to try to get MathSmart for her next." "Congratulations on a wonderful learning resource, and Canadian too! I recently purchased the EnglishSmart 2 workbook, and I am so delighted with the contents."